On August 12, Banyan Air Service, located at Fort Lauderdale Executive Airport, celebrated a long-awaited ground breaking ceremony for a new 25,000-square-foot FBO terminal building, with an attached 20,000-square-foot hangar. Plans for the new terminal were announced in November 2004, but construction had been delayed due to the combination of airport ground issues, financing and building permits. 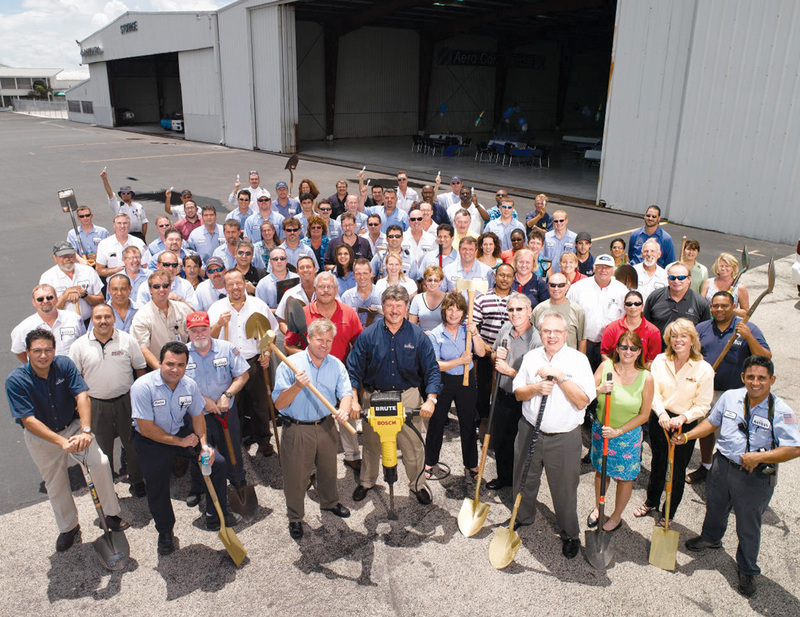 Banyan Air Service, located at Fort Lauderdale Executive Airport, recently celebrated a long-awaited ground breaking ceremony for a new FBO terminal building. This new construction phase is the fourth large project Banyan has done with their landlord, Sheltair/Holland Builders, at Fort Lauderdale Executive. To record this historical event, Banyan teammates were invited to a company lunch held in one of the hangars scheduled to be demolished just two days later, on Monday, August 15. In addition, teammates were asked to bring shovels and participate in a group photo. Walter Rittenhouse, Banyan’s senior VP of technical services, presented a plaque complete with a gold shovel to Don Campion on behalf of all of Banyan’s teammates. Along with Banyan teammates, individuals from FXE airport administration participated in the event, including Clara Bennett, airport manager, and Mark Cervasio, assistant airport manager. General Manager Joan Kuntz, Gene Owen and Mark and Ron Parent, from Sheltair/Holland Builders, also took part in the groundbreaking ceremony. The new terminal will be centered on the south side of airport property, allowing for a more central location on the field, conveniently located just off the main runway. The new location will offer expanded ramp space and closer proximity to Banyan’s existing avionics, maintenance and pilot shop departments. Banyan’s 24-hour fixed base operation caters to individual aircraft owners, corporate flight departments, aircraft charter operations and military and governmental institutions. The full-service FBO’s new terminal will provide advanced business amenities for crews and passengers, including three computer terminals with printers, high-speed Internet access, wireless LAN, photocopiers, fax machines and multimedia equipment, and an ATM machine. Valet parking is expected to be offered at the new facility. Just across from the new terminal, a new 5,500-square-foot pilot shop will be built with ramp-side access for pilots. The new store will offer the company’s current pilot shop an additional 500 square feet of retail space. For more information, visit [http://www.banyanair.com].